Though they had been a peak in dengue cases reported in this year, the disease has not yet reached epidemic proportions. 665 positive cases have been recorded from January to July 9 this year; the figure was much higher in the year 2013 recording upto 2,386 dengue cases. 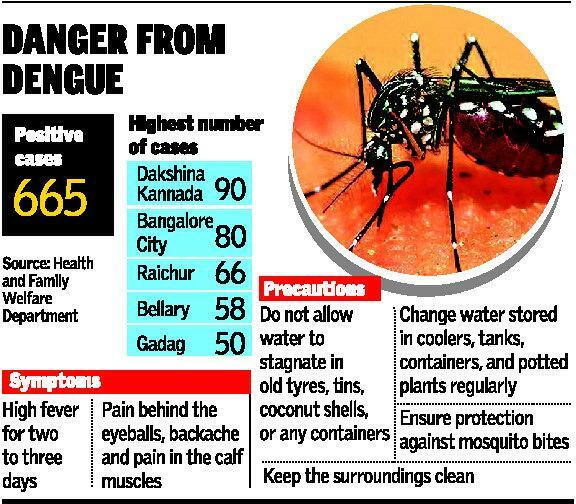 A total of 6,408 confirmed cases of dengue, including 1,047 from Bangalore, were reported in 2013. During the same period in 2012, 3,175 positive cases, including 868 from Bangalore, had been reported from the Health Department. The State Health Director Dr. Geetha Nyamagowder said that the incidence of dengue, a vector-borne disease, was sporadic in nature and “unlike last year there was no outbreak in any particular district.” The disease is caused by aedes aegypti mosquito that breeds in fresh water and are active during the day. This year, the highest number of cases have been recorded in Dakshina Kannada (90) followed by Bangalore City (80), Raichur (66), Bellary (58) and Gadag (50). Dr. Nyamagowder said the department had taken up surveillance measures from March itself and whave also taken up information, education and communication (IEC) activities to create awareness. Last year, the demand for platelets, a vital blood component in treating dengue, went up considerably in Bangalore.